If you need to bulk harvest the Google cached dates for a list of URL’s this free addon included with ScrapeBox can do the job. Google caches pages more frequently when they change often with fresh content and also when Google deems them authoritative due to a good backlink profile and Pagerank. So this addon is ideal for checking the last cached dates of all your pages, which can help find the pages which continually have stale/old caches that could benefit from fresh content and backlinks. It’s also great for seeing if new content is indexed yet, or if your backlinks are indexed. If you have a list of article submission URL’s, forum profiles, blog comments etc, you can run them through the Google Cache extractor and find which of your articles, profiles or comments are indexed and which aren’t. You can then use ScrapeBox to index your backlinks which are not yet cached by creating and submitting RSS feed etc. Old or stale cache dates can also be a sign of non-optimal site structure, pages buried deep within your site requiring numerous clicks from the homepage to reach are harder for search engines and in turn users to discover. 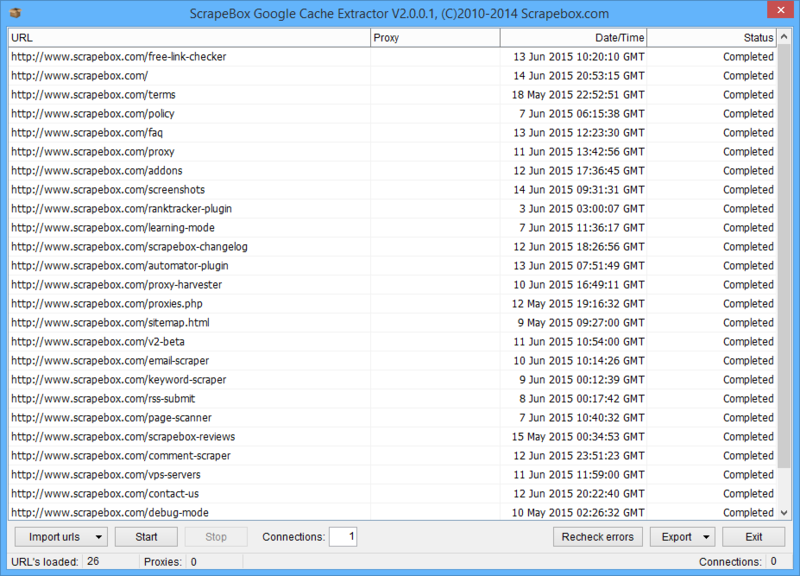 The cache date extractor addon may alert you to valuable content or sections of your site which are buried deeply and missing out on exposure from users and search engines. Once installed you can load a list of URL’s, set how many connections you wish to use this addon is multi-threaded and is capable of checking 100’s of URL’s per minute. You can also use a list of proxies which rotate on every request. Once the cache dates are harvested, you can export them as plain text file, .CSV or as an .XLS spread sheet. v1.0.0.5: Added delay option to help prevent being blocked by Google. Setting the delay to 0 will disable the delay and allow multi-threading. Delay can be set from 0 to 180 seconds (3 minutes). View our video tutorial showing the Google Cache Date Scraper in action. This is a free addon included with ScrapeBox, and is also compatible with our Automator Plugin.